One of the most basic tools in an embroiderer's toolkit is an embroidery hoop. They keep your fabric taut as you work, which makes stitching much easier. Learning how to use a hoop is simple, but it's helpful to know how to set up your hoop for the best results. Another thing to watch out for when hooping your fabric is distortion. Sometimes fabric will pull on the bias, which stretches the material while it's in the hoop. After it's removed from the hoop it will go back to normal, but your embroidery may be distorted. No one likes that! There are different kinds of hoops available depending on your tastes and what you are stitching. 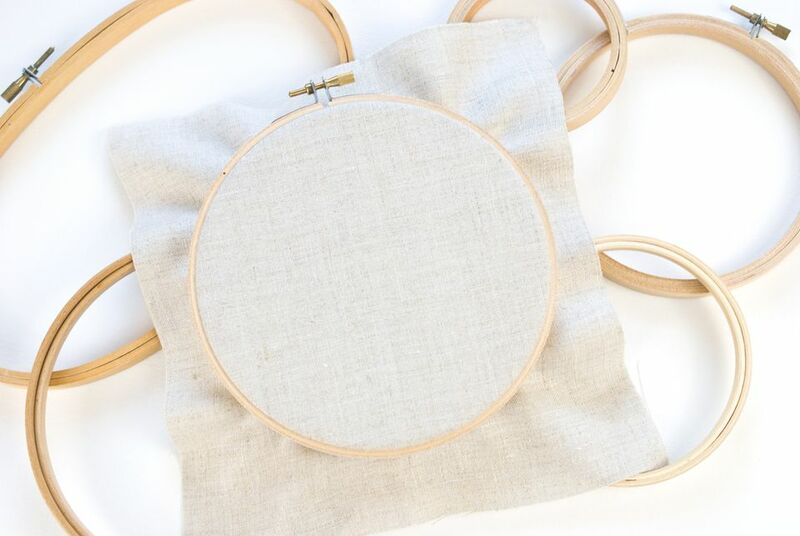 If you like working in a wooden hoop, you can even add binding to one or both pieces of the hoop, which helps maintain even tension as you work. Most embroidery hoops fit together in a similar way, and this tutorial will show you how to get the best tension as you fit your fabric in the hoop. When getting ready to place fabric in a hoop, your first thought might be to loosen the screw on the outer hoop. While you can do that, it's a little easier to leave the hoop in a tight, but not too tight, state. While the pieces of the hoop are together, adjust the screw so that the outer hoop is snug enough to hold the inner hoop in place but loose enough that you can slide the inner hoop out. If you are working with thick fabric or felt, you may still need to loosen it some, but this is a good place to start. Separate the two pieces of the hoop. Place the inner hoop on a flat surface and lay the fabric face up over the hoop. The fabric may sag into the center of the hoop, but that's okay. Just try to keep the material squared up so that you avoid pulling it on a diagonal as you place the outer hoop over the fabric. Note: This tutorial shows how to use a standard hoop, but if you use a spring tension hoop, it's a little different. Instead of placing the inner hoop on your surface, start with the outer hoop and lay the fabric face down over it. Next, squeeze the inner hoop and press it into the fabric and outer hoop. If you can't quite see the edges of the inner hoop, feel where it is and set the outer hoop over the ring. Use both hands to evenly press it down onto the inner hoop. The tension of the fabric should already feel fairly tight, and if it's the way you want it, tighten the screw just a little more to help hold it in place. If the hoop feels too tight to push over the fabric and inner hoop, remove it, loosen the screw slightly and try again. If the fabric feels loose, remove the outer hoop, tighten the screw a little more, and try again. Again, it might seem like you should just tighten the screw until it's snug and then pull the edges of the fabric to make the center of the hoop taut. This will most likely result in distorted fabric grain and it could even damage the material, so try to avoid it. When working stitches using the sewing method (taking your needle from front to back and again to the front in a single stitch, as with stem stitch, coral stitch, and others), it's helpful to have less tension on the fabric. For this, keep the screw a little looser as you hoop the fabric, then tighten it to lock it in place. When you're finished working for a time, remove your embroidery from the hoop until you're ready to start again.